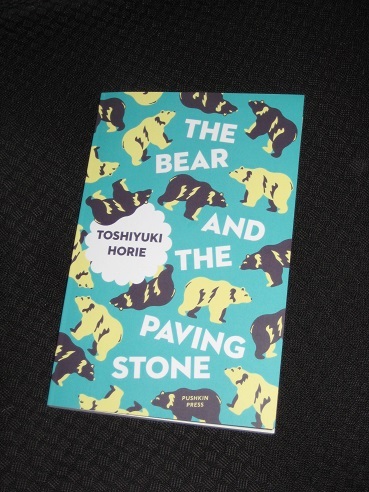 The Bear and the Paving Stone (translated by Geraint Howells, review copy courtesy of the publisher) is a mini-collection of three works by Toshiyuki Horie. The title novella, winner of the Akutagawa Prize in 2000, is the main attraction, but the two shorter pieces included in the book complement the story nicely. There’s enough here to see the kind of writer Horie is, with an initial casual, easy tone gradually revealing concerns with more serious issues. This is certainly true of the middle story, ‘The Sandman is Coming’, which on the surface is simply the description of a day at the beach. The narrator has returned to his home town and is walking on the sand with a woman and her young daughter, and the simple pleasures of the experience remind him of another day, when he spent time here with an old friend. It got to be just like she said. Creating something that we knew would be destroyed was giving us an unexplainable sense of accomplishment that was the opposite of transience, and it was a spur for me as well as for her brother, who must already have been carrying the illness inside him. The last scene, with the writer finding himself transported back to his youth, is a fitting ending to a beautiful story. By itself, ‘The Old Castle’ would be a slight piece, but the effect of the story is heightened by the parallels with the main event, ‘The Bear and the Paving Stone’. Here, too, we are taken off to Normandy, where a Japanese translator of French literature spends a night with an old friend who has to leave the country in the morning. The two men stay up all night talking, and Horie’s story feels just like that, one of those nights of youth where the wine and conversation just keep going (it’s a *good* feeling). There’s far more to ‘The Bear and the Paving Stone’ than a feel-good bromance, though. Gradually, the writer allows us to learn more about Yann, the narrator’s friend, and as can can happen in the early hours of the morning, the mood turns rather melancholy. Yann is a photographer, and as a parting gift, he offers his friend the choice of some of his left-over prints. However, one of the photos, showing a hut for smoking meat, has rather unfortunate connotations for the man who took it. You see, Yann is of Jewish heritage, and the picture allows painful family memories to rise to the surface. Personal sadness. Was there any other kind? Wasn’t sadness something that everyone had to endure individually? Just like anger. The idea that you can share anger or sadness with others is nothing more, really, than a compelling illusion. We can only communicate the pain we feel on an individual level. Unable to share his emotion with his family, Yann is compelled to keep moving and cope with his emotions alone. Very nice, sensitive review, makes me want to read the book. firebird1878 – Thanks 🙂 Definitely worth looking out for.